2018 Update: We still think this is a fun discussion of celebrating Halloween as a mom (including how old is too old for trick or treating!) 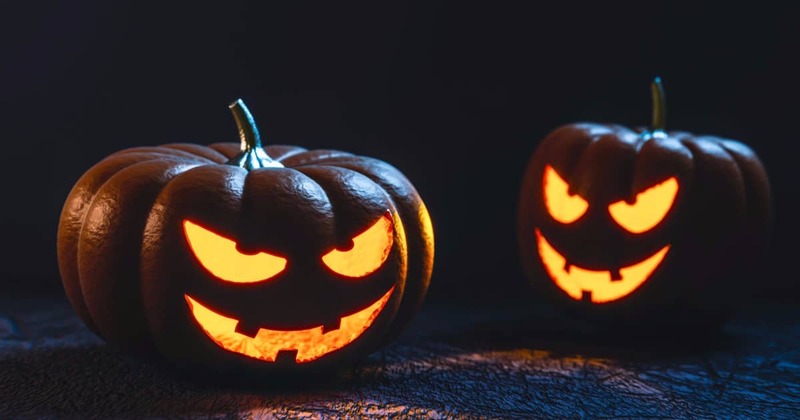 — but you may also want to check out our more recent discussion about whether you should dress up with your kids for Halloween. At what age did you start taking your kid trick-or-treating? On the other end of the spectrum, how old is TOO old, in your opinion? Ever since our son was really young, my parents have invited us to their neighborhood (they’re still in my childhood home, only about a mile from our house) to visit the selected neighbors whom they know well. Some of them have been there for 30 years or more, including the older woman who gives out little bags of homemade popcorn. For the last few years, my husband has also been taking our son around a small part of our neighborhood — lucky kid! I take on door duty while they do that. When he gets a little older, we’ll probably stick to our own neighborhood. Who stays home? Or do you leave out a bowl of candy and hope for the best? What candy do you give to trick-or-treaters? My usual strategy — because of my major sweet tooth — is to buy something I don’t really like (e.g., Blow Pops, Skittles), so that the candy hasn’t disappeared before Halloween even arrives. Do you do that, or do you actually have self-control, unlike me? (That doesn’t mean I don’t, er, “sample” some of my son’s candy stash after he goes to bed … but I suppose he’s getting a bit old for that to go undetected. Darn.) How about allergies? Do you try to be cognizant of allergy issues when you buy treats to hand out? Do you take part in the Teal Pumpkin Project? All you do is buy some non-food items to either put in a separate bowl from your candy, or give as the only option, and then display either a teal pumpkin or teal pumpkin sign at your house. (You can add yourself to the Participation Map if you like.) 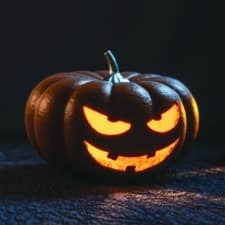 Does your own child have food allergies that you have to be careful about at Halloween, and if so, how do you handle it? More fun Qs: What is your kid dressing as this year? Have you heard of the awesome Take Back Halloween project? Are you being a Halloween supermom and making your kid’s costume? What was your favorite Halloween costume as a kid? (Also, do anyone else’s pumpkins get devoured by sneaky squirrels like ours do?) What are your best Halloween strategies as a working mom? … no fun sized candy bars at my house!! 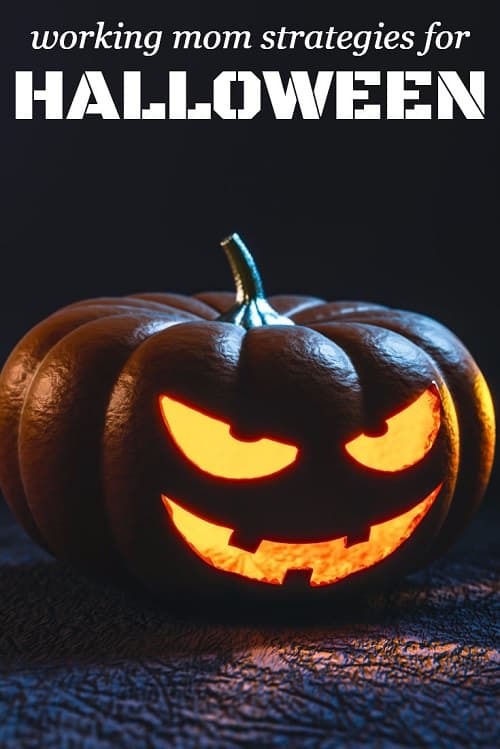 It was always a thing at my house growing up – we were the only house on the block that gave out full-sized candy and the kids in the neighborhood knew it and talked about it leading up to Halloween. So, now that I have my own house in a very trick-or-treat friendly neighborhood, we do the same and I sort of love it. The kids are SO excited to get a full sized candy bar – audible and hysterical reactions when you hand it to them. Kat, you are a genius. I use this strategy for bringing treats to parties too. I think we started trick-or-treating for real around age 3, maybe? Before that, kiddo had a costume but it was mainly to show off to the grandparents. We all go trick-or-treating together; nobody gets left behind at home. I put a big bowl of candy on our front stoop and hope for the best. It seems to work fine, and I really don’t care if some kid runs off with the whole thing. I give out our favorite kinds of candy. So, lots of chocolate, obviously. If we have leftovers, I want to enjoy it! I’m having a bit of Halloween guilt because I buy a character off the shelf instead of making a costume. For most of our lives, I try to avoid the one-use character-branded items, but dammit I just don’t have time to fashion a ninja princess warrior costume or whatever awesome thing my kids would ask for. So PJ Masks it is. I’m pretty sure my son was just as happy to wear his Amazon-bought Kylo Ren costume as he was to wear the homemade germ and Mars Rover costumes. (My husband made them.) I don’t think you need to feel guilty at all! We live in the ‘burbs where we have 1-acre zoning. We live on a main street and rarely get trick or treaters, but the neighborhood behind us is full of kids. At 2, we took our daughter to the downtown trick-or-treat where she went store to store at 4pm. Then on Halloween proper we took her down our street (like, 5 houses). We left a bowl of candy out and some was gone when we got back. This year we’ll go as a family to the town halloween party and trunk or treat. Nursing home trick or treat this year is during the workday so I’m skipping it. We’ll walk the neighborhood if the weather is nice as a family and if it isn’t, a grown up will stay home with the baby. We do all the daytime stuff so that if it’s cold or miserable out on halloween night, our kid still gets to do “halloween” even if we bail entirely on the evening trick-or-treat. When kiddo was a baby, we walked her around in a costume just to say hi to the neighbors. The next year, we did 2 houses of real trick or treating before she decided she had enough candy and was done. That year I sewed a face on a hoodie sweatshirt, and that was kiddo’s “costume.” Last year she raided her dress up bin and several neighbors in our apartment building agreed to hand out candy so the few kids in the building could trick or treat without going outside (yay!). This year she is going with her dad, and he bought her a store-bought costume. I won’t get trick or treaters unless I arrange something with the other parents in the building. I’m mulling on that one…. As far as teal pumpkin; I offer some “high value” stickers (puffy ones or scratch and sniff or something), glow sticks or glow stick jewelry, and matchbox cars or small toys. Especially for the little kids, these are often more exciting than candy. Our neighborhood doesn’t do much trick-or-treating (older folks generally), so we go to my in-laws’ house and meet up with other aunts, uncles, and cousins. Last year, Kiddo and Cousin were 1.5, and we made it half-way around the block and to maybe half a dozen houses before Cousin’s diaper fell off and both kids were tired and confused. This year, they’re 2.5, so I expect we may make it all the way around the block and to maybe a dozen houses, but who knows. I am semi-making Kiddo’s costume this year. I bought pants and a shirt and an accessory, am re-purposing some shoes, and will make two accessories out of felt (maybe? or beg my SIL to help?). All this is because I got attached to an idea, there’s no ready-made costume available for it, and I couldn’t let it go and just buy a damn costume. we have a million trick or treaters – not really, but we gave out hundreds of pieces last year? I think we bought 600 this year but our neighbor said he had 1400 light up toys after last year sooo anyways. Needless to say, our block is insane. Lots of people socialize in front yards but then who gives out your candy? It’s a problem! I almost want to hire someone! Houses are just far enough apart that you wouldn’t be able to have a convo door to door. This was how I resolved my teenage “desire to participate but awkwardly too old for trick or treat” – I passed out candy while my mom hung out with neighbors and my dad walked around with my (several years younger) brother. Sometimes I even got to invite a couple friends over to help me. We went all out; dry ice in the candy bowl, scary music playing in the background, wore costumes, lights dim. If you have teenagers in the neighborhood, ask them if they’ll come hand out candy for you (for a small amount of pay, maybe)! I’m pretty sure I didn’t get paid, but I was also begging my mom to let me do it. I would love to take my kids trick-or-treating in my old ‘hood! That sounds so fun. But Facebook happened to where I grew up, so very, very few houses are left from when I was a kid so it’s not the same. We moved cross-country on DS1’s first Halloween and I was very pregnant for the second, so we haven’t done much. Now we own our house (yay!) and the community does a trick or treat so we’ll be doing that, plus a party for daycare and one at my office. Per DS1, we’ll all be dressing as cats. Fine with me, we can wear normal clothes with ears & tails! Last year I did a combo of candy and glowsticks, which were a huge hit. Ran out of both before sundown as we live in the type of dense neighborhood kids are driven into just for the purpose of trick-or-treating.